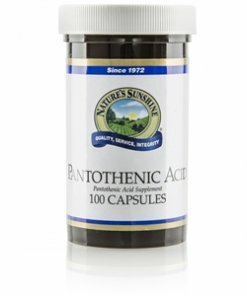 Nature’s Sunshine Pantothenic Acid supports the glandular and nervous systems. Otherwise known as vitamin B5, pantothenic acid is partially produced by bacteria in the intestinal tract. Pantothenic acid works in conjunction with other B vitamins and is water-soluble. It helps the adrenal gland function properly, assists in energy production, and promotes natural growth and healing processes. It also encourages healthy development of the central nervous system and assists in steroid hormone and acetylcholine production. Pantothenic acid works best when taken with other B vitamins. Di-calcium phosphate, cellulose (plant fiber), magnesium stearate (vegetable), gelatin, and water.